In January, students and staff members voted on which part of the world they would like to support. With more than 225 votes, Guatemala was selected to benefit from the efforts. Those at Memorial learned that children in Guatemala walk to school up to five hours in treacherous terrain and face dangerous risks such as gang violence, kidnapping and getting lost. Through the sale of bricks, Memorial is aiming to raise enough money to build a school closer to Guatemalan students’ homes so that they can avoid these obstacles. Paper representations of the purchased bricks display the donors’ names and are displayed in Memorial’s main lobby to form a “Building schools one brick at a time” collage. As of now, more than $2,000 has been raised, as is illustrated through a thermometer and bricks poster chart that is also showcased by the front entrance. 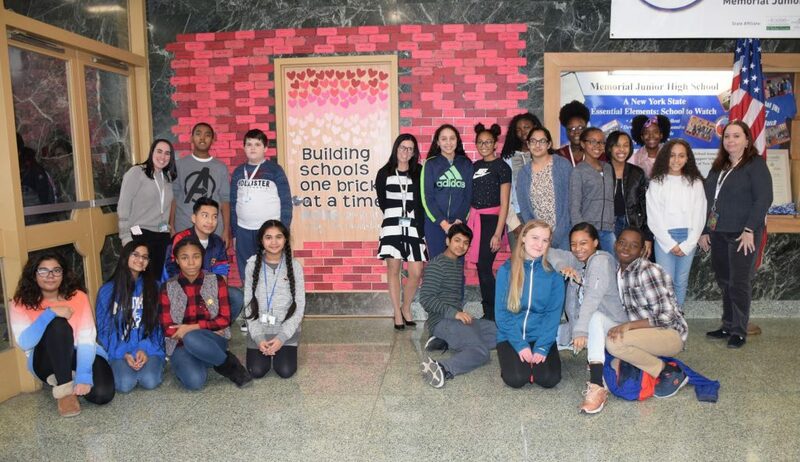 Photo Caption: Members of Memorial Junior High School’s BRAVE Club in front of the bricks collage that represents the schoolwide fundraiser to build a school in Guatemala.